This blog post is one in a series detailing President Obama’s budget proposal for fiscal year 2013. Most of the attention on President Obama’s proposed tax changes in his 2013 budget proposal has focused on his proposal to sunset the Bush tax cuts for household income above $250,000 per year and his long-term goal of using the “Buffett Rule” to replace the Alternative Minimum Tax. Looking beyond the headlines, however, reveals some proposals that have relevance for future tax reform efforts at the federal and state levels. On the personal income tax, for example, President Obama proposes to reduce the value of many income-tax exclusions and deductions for high-income Americans. Under the current system, the value of these exclusions and deductions are significantly higher for high-income households than lower-income households: $1 in such deductions and exclusions reduce the tax liability of high-income households by up to 35 cents, compared to 10-25 cents for low- and middle-income households. The president’s proposal, originally part of his American Jobs Act, would cap the value of those exclusions and deductions at 28 cents on the dollar for high-income households. Similar proposals to reduce the value of tax subsidies for wealthier households at the state level could raise tens to hundreds of millions of dollars in additional revenue for North Carolina without raising income tax rates. Also among the President’s proposed tax changes are provisions that would close some of the most egregious corporate tax loopholes. For instance, Obama’s proposed budget would eliminate a loophole that allows corporations to deduct interest expenses from overseas investments even when indefinitely deferring US taxes on the income from those investments. The budget also proposes eliminating a loophole that allows corporations to shelter profits from intangible assets, often by transferring those assets to foreign subsidiaries and charging themselves royalty payments, that has particular relevance for state corporate income taxes. After tax changes enacted during the 2011 session of the General Assembly, North Carolina’s corporate income tax laws now allow many multi-state corporations to take advantage of a similar loophole by transferring trademarks to no-tax states like Delaware and Nevada. 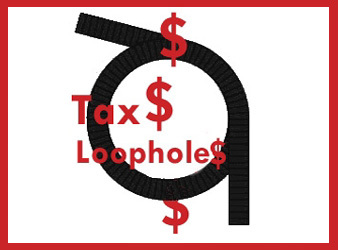 Just as the Obama administration proposes closing this loophole at the international level, state policymakers could close this corporate tax loophole — as well as many others — by following the lead of the majority of states with a corporate income tax and requiring a parent corporation and its subsidiaries in other states to file a joint tax return (i.e. “mandatory combined reporting”). President Obama’s budget may demur on taking on comprehensive tax reform, but several of the proposed tax changes do set the stage for key reforms at the federal and state level.